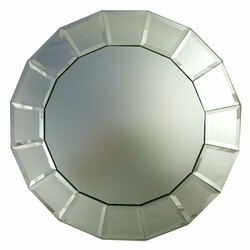 ChargeIt by Jay Beveled Block Mirror Round Charger Plate 13"
Home > Products > ChargeIt by Jay Beveled Block Mirror Round Charger Plate 13"
Impress your guests by serving multi-course meals on the ChargeIt by Jay Beveled Block Mirror Round Charger Plate 13". Combining a classic style and contemporary look, this charger plate features a beveled block border and defined rim that pairs beautifully with china and adds a modern touch to any table setting. Made from premium quality mirror glass, this charger plate has a delicate look while being exceptionally tough and durable. The mirrored surface of this charger beautifully reflects lighting, setting a romantic ambiance to any high-class event. To keep this charger plate in excellent condition, hand washing is highly recommended.